China : Macau & Hong Kong : April 15 - 18 cont'd - wonderpaars jimdo page! The ferry ride to Hong Kong was effortless - easy, fast and efficient. Within the hour, we were disembarking into a whole new world. The best thing was it actually added an new mode of transportation to our list: Hydroplane boat. This boat, at certain speed levels would lift it's entire hull out of the water and glide above it. It was by far the smoothest boat ride of trip. 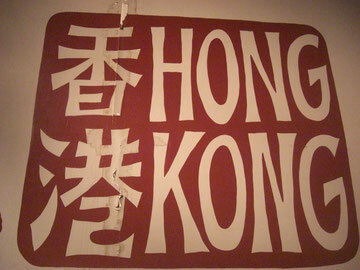 We had decided to stay on the Hong Kong side in Causeway Bay, instead of the usual tourist destinations in Kowloon. The subway was easy enough to decipher, the roads up above a bit more difficult. Standing on a street corner, looking a bit perplexed, a kind woman asked us if we needed any help. We were not expecting such unsolicited kindness and it immediately changed our feelings of frustration to feelings of adventure. Our guesthouse, like most of the guesthouses in Hong Kong was part of an apartment that was hacked into small units and then rented out for relative high prices. We got lucky with our window and private bath stall - though the room was no larger than the two twin beds that occupied it. And for $50US a night, we just had to laugh and be happy to have this as just part of the Hong Kong experience. A quick change of clothes and we were on our way. Upon our arrival in Hong Kong, the preoccupation with style, consumerism, fashion and outer appearances was hard to ignore. Most subway stations are simply the ground floor to a monstrous shopping complex that can go up to 10 floors. One pristine shop next to another, and each one is more flawlessly designed than the next. The people are dresses impeccably, with coiffed hair and the latest hand accessories slung over their shoulders. It was like watching a VOGUE magazine come to life. Amongst the madness of the stores, there is usually a food court, offering any number of worldly fares. We each followed our fancy and over lunch, made plans for our few days in this wildly crazy place. Our bags were full and our allowance on clothes was spent in Vietnam, so we would have to find activities that kept us out of the shopping frenzy. A quick visit to both Shanghai Tang’s (Hong Kong’s ultra modern approach to traditional Chinese garments) and H&M was a reminder that we indeed had no needs to fill. We walked this Central area and then made our way up to the Peak Tram. This cable car like contraption ascends the steep incline of one Hong Kong neighborhood and the reward is the view from the top. The weather was a dream, the timing perfect and the view astounding. Hong Kong belongs to China. We learned today that it is special. And the reason it is special is money. When the English returned Hong Kong to the Chinese in the late 1990’s it was under the stipulation that it would remain as an intact entity. Because of the amount of wealth that is generated on this little piece of land, the Chinese government maintains its structure by only supplying a governing committee. We learned these little insights from a family friend of Alex's who has lived in Hong Kong for nearly 20 years and has watched its growth and change. He invited us to a traditional dim sum lunch, with his office staff, and there gave us a bit of a tutorial about how this place works. After lunch, we followed our friend's advice and checked out Wong Tai Sin temple. It is the largest Taoist temple complex in Hong Kong and so it was interesting for us to see it. The most interesting part of it was probably not the buildings but a long row of little cabins rented out to truth sayers and palm readers, all waiting to read the palms of anyone needing clarity or answers. There is also a Chinese pharmacy that dispenses all sorts of potions and remedies. From there we headed to the Hong Kong Museum of History, where we intended to learn more about the actual history of this very intriguing city. We both were quite impressed by this museum. It showed us a complete view of the region's history and the different ways of life doing the different periods of time. We actually stayed in the museum until it closed and from there taxied to a shopping mall that we wanted to check out. This shopping mall was called Elements and was designed in conjunction with the four elements (wind, water, fire and earth). We were hoping it would be a new kind of green shopping experience, but were quite disappointed when the elements were simply used to create different color schemes and sections. Leaving the mall we headed towards the Temple Street night market on Kowloon, had dinner there, checked out the products (most of them were very low quality) and ended up getting a 60 minute foot massage. At 10pm, we were suprised how many stores were still open, how many people were still in the streets and that the city was still buzzing. With our feet rejuvenated we walked all the way down to the waterfront and took Hong Kong's famous Star Ferry across Victoria Harbour. From the pier, we headed straight to the mountain to the Lan Kwai Fong area, along D'Aquilar Street, to enjoy some really nice German beer in one of the many bars there. Finally, the double decker trolley took us back to our guesthouse. Good morning Hong Kong! Today we decided we needed to go and see the other side of the island of Hong Kong. So we took the local bus all the way to a little town called Stanley, which was known to have a nice market. However, when we arrived we have to realize that that also was more or less just a tourist trap. It was very very little of interest to us, although Alexandra did see a few bags she liked. After an hour or two boarded the bus back to down town Hong Kong, so that we can take the harbor tour to check out Victoria Harbour. It was a nice and pleasant ride but as we cruised through the waters Alexandra and I counted over 20 police boats patrolling the harbor. We soon learned that they were practicing for the arrival off the Olympic flame on May 6. Today was their dry run. After about one hour on the boat we got off and headed towards the tea Museum, where we planned to join the offered "tea appreciation class". It turned out to be a fun little event and we both learned quite a bit more about tea. All this venturing had made is quite hungry and so we went to get some food. The highlight of the day was about to come: we have tickets for the theater. We really did not know how well would be, but it had been over 10 months since we've seen a theater production. It was well done, and we had a good time on our last night in Hong Kong.